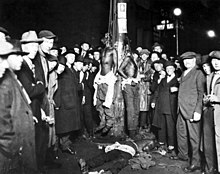 In the United States, lynchings of African Americans, typically by hanging, became frequent in the South during the period after the Reconstruction era and especially during the decades on either side of the turn of the 20th century. At the time, Southern states were passing new constitutions and laws to disenfranchise African Americans and impose legal segregation and Jim Crow rule. Most lynchings were conducted by white mobs against black victims, often suspects taken from jail before they were tried by all-white juries, or even before arrest. The political message—the promotion of white supremacy and black powerlessness—was an important element of the ritual. Lynchings were photographed and published as postcards, which were popular souvenirs in the U.S., to expand the intimidation of the acts. Victims were sometimes shot, burned alive, or otherwise tortured and mutilated in the public events. In some cases the mutilated body parts were taken as mementos by the spectators. Particularly in the West, other minorities—Native Americans, Mexicans and Asians—were also lynched. Southern states had the highest total numbers of lynchings in America. 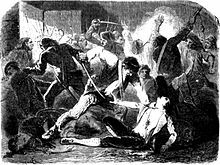 The origins of the word "lynch" are obscure, but it likely originated during the American revolution. The verb comes from the phrase "Lynch Law", a term for a punishment without trial. Two Americans during this era are generally credited for coining the phrase: Charles Lynch (1736-1796) and William Lynch, who both lived in Virginia in the 1780s. Charles Lynch has the better claim, as he was known to have used the term in 1782, while William Lynch is not known to have used the term until much later. There is no evidence that death was imposed as a punishment by either of the two men. In 1782, Charles Lynch wrote that his assistant had administered "Lynch's law" to Tories "for Dealing with Negroes, &c."
^ a b Waldrep, Christopher (2006). "Lynching and Mob Violence". In Finkleman, Paul. Encyclopedia of African American History 1619–1895. 2. New York City: Oxford University Press. p. 308. Fleming, Walter Lynwood (1911). "Lynch Law" . In Chisholm, Hugh. Encyclopædia Britannica. 17 (11th ed.). Cambridge University Press. p. 169.